Abstract: The reason I found it so frustrating trying to unlock the XP 2100+ was because the L1 technique simply wasn't working anymore! 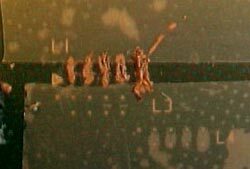 Unlocking AthlonXP processors have always been relatively easy to do - just fill the laser cut valley's with some sort of non conductive filler and short the L1 bridges with a conductive material. That was then, and with the release of the AthlonXP 2100+ things have gotten a lot more difficult. Is this a sign of things to come for future AMD processors like the Thoroughbred? I've unlocked a few of the brown AthlonXP processors in the past and have never had any problems which weren't resolved by the second or third attempt. With the green AthlonXP 2100+ I tried at least five times with no success. The reason I found it so frustrating trying to unlock the XP 2100+ wasn't because I was not connecting the L1 bridges properly, but because that technique simply wasn't working anymore! So what was going on? After all, the same method worked with the most recent processors AMD released; the AthlonXP 1800+, 1900+ and 2000+. What was so different about the 2100+? Looking very closely at the AthlonXP 2100+ processor, and knowing that the L3 and L4 bridges controlled the actual multiplier (connecting the L1's unlocks the multiplier setting), we noticed that the AthlonXP 2100+ processor's OPGA was layed out a bit different. The L2, L6, L7, L8, and L9 bridges are all cut in the same fashion on every XP CPU we've seen to date, but with the AthlonXP 2100+ processor the L10 bridges were switched around (what was open was closed, and what was previously closed was now open). The L5 bridge by the way, holds the SMP lock. Closing the L1 Bridges didn't work. It only brought us a 14x multiplier. Nuts to this I thought. I wanted to see what the AthlonXP 2100+ processor could really do so I brought the XP 2100+ to the expert, Mike V. Mike has unlocked somewhere between 50-100 AthlonXP processors and has quite a bit more experience at this then I do. Together we browsed the web to see if anyone else has been having problems unlocking the AthlonXP 2100+ processor, and more importantly who has unlocked the chip correctly. One post over at the Icrontic forum's caught our eye's (like a big pizza pie, that's amore!) attention because it gave us a few good clues as to how we might tame the AthlonXP 2100+ processor into submission. Within the forum we read about a users attempt at unlocking his AthlonXP 1600+ which was reportedly also an AGOIA stepping like our AthlonXP 2100+ processor. Then it dawned on us, if we couldn't unlock the AthlonXP 2100+ processors multiplier as it stood, why not just change actual multiplier settings on the OPGA so that the processor in effect becomes an XP 1600+ (with an unlocked multiplier). The difference is this, when the computer looks at the chip it would by default see an AthlonXP 1600+, but the multiplier would be free to be changed between 6X and 12.5X. 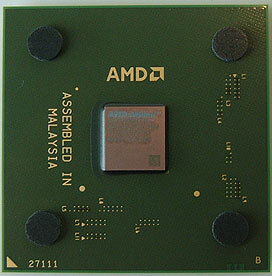 This is possible because AMD have all the multiplier settings on the surface of the OPGA packaging. So we decided to modify our AthlonXP 2100+ processor to a XP1600+ basically because the user on the Icrontic forums said he had an AGOIA 1600+. We could have set it to just about any other speed, but we figured we would use that as our reference guideline because that was the only chip we had in hand to compare with. Personally, I was a bit skeptical that this AXP21K+ trick would work, but Mike who is indeed a master knows quite a bit more about modifying hardware components so I stood by as he brought out the power tools.... the Dremel Model 290.